CRAZY DISCOUNT! Was: $399.95 Now: $249.97! 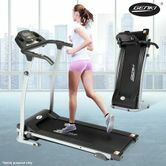 Stay fit and keep up with your cardio with the Genki Electric Treadmill. Alter the speed from 1 - 12 KM speed based on your fitness level. Large LCD digital display will give you clear settings for your preferences. A pulse sensor can check your pulse and monitor your health anytime for safety. A safety clip is installed for quick shutdowns if necessary. This Treadmill is equipped with clear settings and safety features to avoid accidents. Have a safe and productive workout with the Genki Electric Treadmill. Great thank you. Very nice machine. Had some issues but resolved satisfactorily.